Out of the ashes. Many things rise out of the ashes. The phoenix, of course, rises from the ashes with new life. 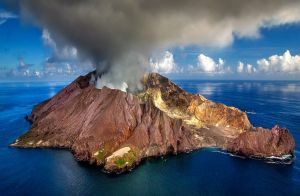 Islands are formed out of the ashes of volcanoes. When fire and destruction come, we find strength and hope in each other and we rise up to begin again. It doesn’t always happen in a moment. We need time to find our way again, to struggle through the grey clouds, to step around the smoldering embers of what we had to leave behind.